healthy heart soup recipes. These mildly-spiced, warm Healthy Heart Veg Soups will make you smile when you realize how easy it is to enjoy good health without compromising on taste! From creamy soups to clear soups and chunky broths, these heartening soups are all made with low-cal, low-fat and nutrient-rich ingredients, which help keep your heart fit and healthy. Lose yourself in the soothing comfort of these warm and nutritious soups. Oats and Vegetable Broth is a super filling recipe loaded with antioxidants will prevent your body from oxidative damage and protects the heart from diseases. Moreover, oats provide soluble fibre which has a great cholesterol reducing effect. Adding dals make your broth more flavourful and gives it a creamy texture while adding vegetables makes it crunchy, the combination is mind-blowing. Don’t believe us? Try Lentil and Vegetable Broth and you will definitely agree with us. Tired after a busy day and need some nerve soothing soup? Then try your hands on Quick Vegetable Broth that’s easy to make, requires minimal efforts and has an amazing taste and colour. This old-fashioned Moong Soup is sure to bring back memories of momma’s loving care. Guaranteed to rejuvenate you on a tiring day, this soothing soup is mildly flavoured with a tempering of cumin seeds and curry leaves. Often we make this Green Peas and Mint Soup which is one of our favourite recipes from this healthy heart soups collection, it is rich in Fibre and Vitamin C and has fair amounts of minerals that help in heart functioning. Add cereals or pulses to your soups if you’re too lazy to cook a meal, just like this Nourishing Barley Soup; well satiating, tasty and a good source of protein too. Bean and Tomato Soup is another soup recipe prepared with beans, good for maintaining cells and arteries in your body. 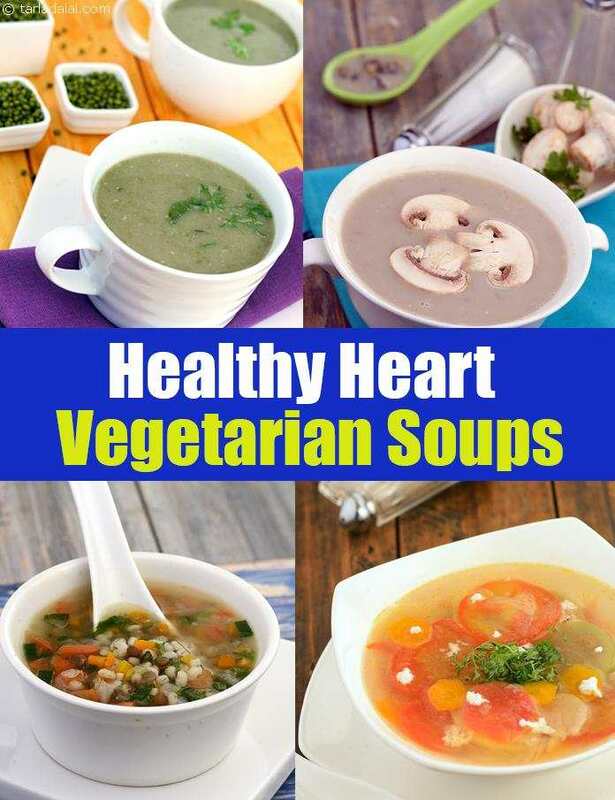 Try our healthy heart soup recipes and other healthy heart recipes below.